I have another new apron. This one was made from a reproduction 1930s print fabric I bought at my local quilting fabric store, Country Sewing Center. 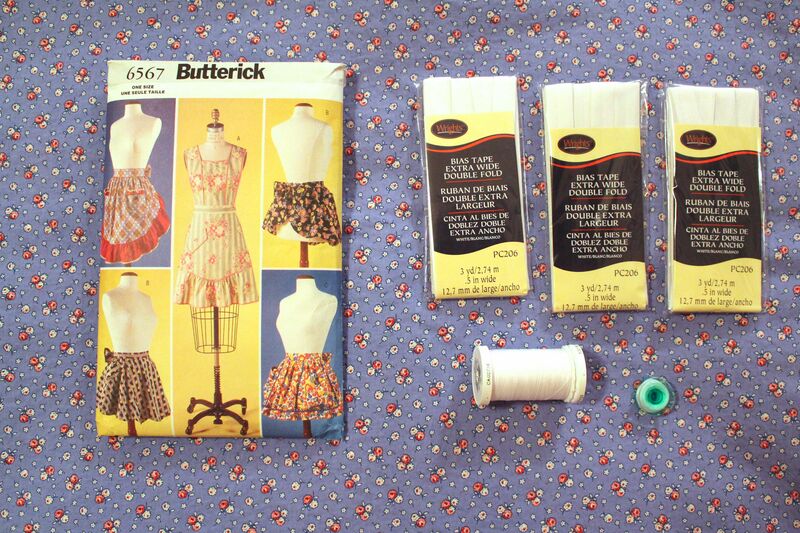 The Butterick pattern is out of stock. I made View A, the one in the big photo in the middle of the pattern envelope. This apron had a bit of a weird construction technique with the straps that go from the front waistband over the shoulder to the back waistband. They are edged in double-fold bias tape and then lapped over the middle bodice piece and back horizontal strap and sewn from the right side. Since I had a little problem using pinking shears on lapped seams after I sewed them with the last apron, I pinked the edges before sewing this time around. Much smarter. 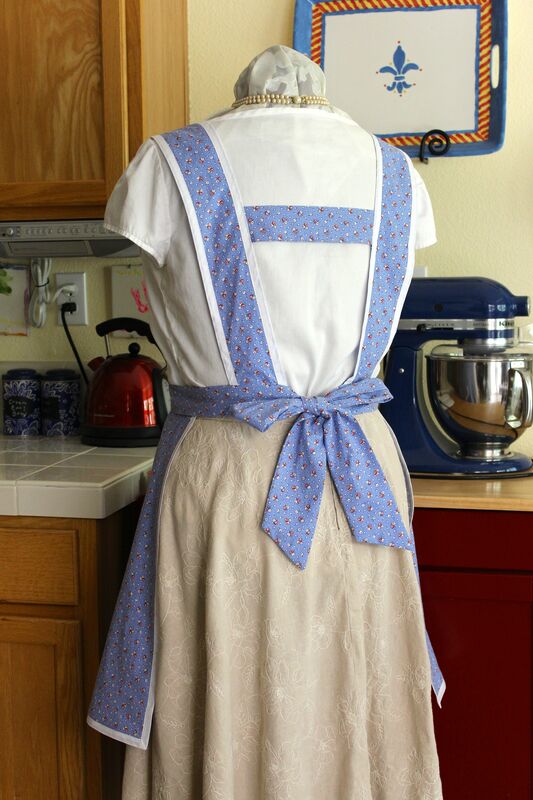 How cute is this apron? The pocket can’t hold much besides a cell phone, but it looks good. Gene is in my kitchen, in front of my baking cart. I’ve been using the other apron I made, and it is so cheerful. I like a LOT of color in my kitchen, so both my new aprons make me happy-happy. 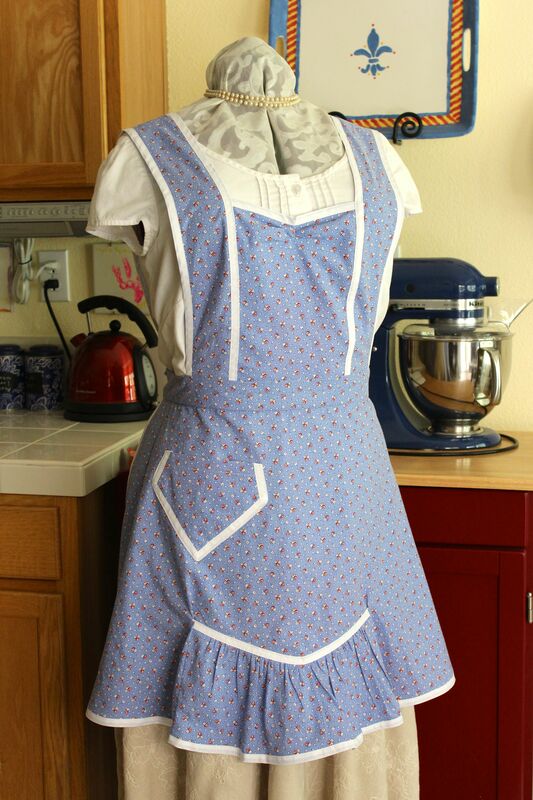 Since I always leave my latest completed project on Gene the Dress Form until I need her for the next project, I won’t be using the new apron for a few days. Today, I just finally looked through the Apronology magazine I bought a few months ago. Full of gorgeous aprons, many of which are way too nice to use. I totally understand!